Obtain the future tendency of China's PF industry during 2017-2021. As the largest PF producer and consumer in the world, China has 36 PF manufacturers with a total capacity of 743,000 t/a (excluding Taiwan Province) in 2016. Both the production of and demand for PF in China increased in 2016. Though the domestic PF capacity has kept exceeding the demand in the past few years, some companies still expand their PF capacities or build new production lines. Will the PF capacity increase or reduce in the next few years? And what activities the domestic companies involved in PF? China is a net importer of PF, and quite a lot of PF is imported each year. However, with the technological improvement and production expansion, the import volume of PF kept decreasing from 2005 to 2009 and fluctuated irregularly from 2010 to 2013, and it also decreased in 2014 and 2015. The net import volume of PF kept decreasing since 2006. How about the detailed import and export of PF in 2016, and what is the trend in the coming few years? Chinese PF industry is greatly influenced by the development of its downstream industries, especially the glyphosate industry. PF is only consumed in glycine route. How is the operation of China's glyphosate industry especially the one adopting glycine route in 2016? Resin is the second largest end use segment of PF in China. 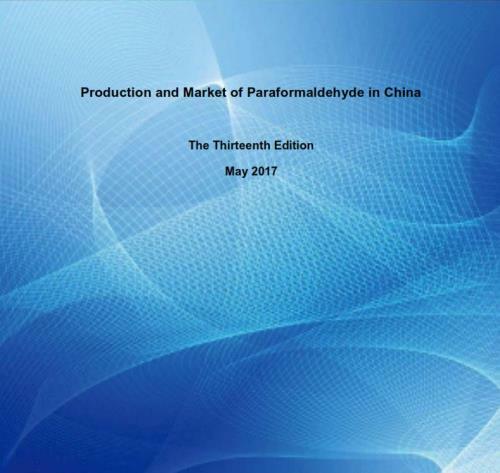 Along with the increasing concern on environmental protection and healthy life, PF gradually substitutes formaldehyde to produce resins. How was the market situation of PF consumed in resin industry in 2016? 7.1.1 Zhenjiang LCY General Chemical Co., Ltd.
7.1.3 Hebei Jizhou Yinhe Chemical Co., Ltd.
7.1.4 Nantong Jiangtian Chemical Co., Ltd.
7.1.5 Wanhua Chemical (Ningbo) Co., Ltd.
7.1.6 Hebei Yuhang Chemical Co., Ltd.
7.1.7 Zhejiang Ailide Chemical Co., Ltd.
7.1.9 Chengdu Weite Plastic Co., Ltd.
7.1.10 Jinan Xiangrui Chemical Co., Ltd.
7.1.11 Shouguang Xudong Chemical Co., Ltd.
7.1.12 Anhui Denuo Chemical Co., Ltd.
7.1.13 Jiangsu Sanmu Group Co., Ltd.
7.1.14 Shandong Binzhou Xintianyang Chemical Co., Ltd.
7.1.15 Xinle Dongyuan Jinhua Co., Ltd.
7.1.17 Shandong Shuangqi Chemical Co., Ltd.
7.1.18 Zouping Qixing Chemical Co., Ltd.
7.1.19 Zibo Qixing Chemical Technology Co., Ltd.
7.1.20 Linqu Outai Chemical Co., Ltd.
7.1.22 Linyi Shengyang Chemical Co., Ltd.
7.1.23 Renshou Chaoguan Chemical Co., Ltd.
7.1.24 Chengdu Wulian Chemical Co., Ltd.
7.1.25 Hebei Xinhua Co., Ltd.
7.1.26 Haiyang Chemical Factory of Bazhou Shengfang Jingtian Wood Co., Ltd.
7.1.27 Taizhou Zhongrong Chemical Co., Ltd.
7.1.28 Linyi Jumeng Industry & Trade Co., Ltd.
7.1.29 Leshan Hongya Chemical Co., Ltd.
7.1.30 Nanhe Huayang Silicon Industry Co., Ltd.
7.1.31 Shandong Linsen Industry Co., Ltd.
7.1.32 Inner Mongolia Jiaquan Chemical Technology Co., Ltd.
7.1.33 Linyi Liheng Chemical Co., Ltd.
7.1.34 Linyi Ruiyin Chemical Co., Ltd.
7.1.35 Qingzhou Hengxing Chemical Co., Ltd.
7.1.36 Xinjiang Dearsun Chemical Co., Ltd.
7.2.1 Guangxi Xintiande Energy Co., Ltd.
7.2.2 Hubei Yihua Chemical Industry Co., Ltd.
7.2.3 Shandong Zhengxin New Energy Co., Ltd.
7.2.4 Ningxia Duoli New Material Technology Co., Ltd.
7.2.5 Xinjiang Wanchang New Energy Co., Ltd.
7.2.6 Dongying Fangzheng Chemical Co., Ltd.
7.2.7 Qinyang Yongrun Technology Development Co., Ltd.
7.2.8 Wensu Xinda Chemical Co., Ltd.
7.2.9 Hebei Donghua Jiheng Chemical Co., Ltd.
7.2.10 Anhui Hongyuan Chemical Technology Co., Ltd.
Anhui Denuo Chemical Co., Ltd.
Anhui Hongyuan Chemical Technology Co., Ltd.
Chengdu Weite Plastic Co., Ltd.
Chengdu Wulian Chemical Co., Ltd.
Guangxi Xintiande Energy Co., Ltd.
Haiyang Chemical Factory of Bazhou Shengfang Jingtian Wood Co., Ltd.
Hebei Donghua Jiheng Chemical Co., Ltd.
Hebei Jizhou Yinhe Chemical Co., Ltd.
Hebei Yuhang Chemical Co., Ltd. Inner Mongolia Jiaquan Chemical Technology Co., Ltd.
Jinan Xiangrui Chemical Co., Ltd.
Leshan Hongya Chemical Co., Ltd.
Linqu Outai Chemical Co., Ltd.
Linyi Jumeng Industry & Trade Co., Ltd.
Linyi Liheng Chemical Co., Ltd.
Linyi Ruiyin Chemical Co., Ltd.
Linyi Shengyang Chemical Co., Ltd.
Nanhe Huayang Silicon Industry Co., Ltd.
Nantong Jiangtian Chemical Co., Ltd.
Ningxia Duoli New Material Technology Co., Ltd.
Qingzhou Hengxing Chemical Co., Ltd.
Qinyang Yongrun Technology Development Co., Ltd.
Renshou Chaoguan Chemical Co., Ltd.
Shandong Binzhou Xintianyang Chemical Co., Ltd.
Shandong Linsen Industry Co., Ltd.
Shandong Zhengxin New Energy Co., Ltd.
Shouguang Xudong Chemical Co., Ltd.
Taizhou Zhongrong Chemical Co., Ltd.
Wensu Xinda Chemical Co., Ltd.
Xinjiang Dearsun Chemical Co., Ltd.
Xinjiang Wanchang New Energy Co., Ltd.
Xinle Dongyuan Jinhua Co., Ltd.
Zhejiang Ailide Chemical Co., Ltd.
Zhenjiang LCY General Chemical Co., Ltd.
Zibo Qixing Chemical Technology Co., Ltd.
Zouping Qixing Chemical Co., Ltd.